Warehouse? School? Retail/Office? 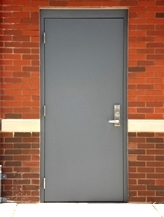 Commercial buildings require a different type of door than residential. Often times they require fire ratings, exit devices, or self-closing systems. We now handle hollow metal doors and frames to fit these needs. Even if you only need to replace a door for your existing frame, we can have a door slab prepped to match your specifications. Most of the products are available in 3-5 days.